At Buckingham Insurance we are firmly of the opinion that insurance should not be treated as a commodity, to be bought at the lowest price possible. This approach is damaging to the business world as price prioritised comparison sites commit customers to a ‘one size fits all’ approach, rather than a product or products that are a suitable fit for the risks inherent in your specific industry. However there are also some less obvious and more niche ways that using a broker such as Buckingham Insurance can benefit your business. Rather undervalued these days but having a company you can build up a relationship with sets you up for success massively. Mutual trust with your broker means that we’ll be looking out for the best deal for you, and understanding your business means we can help you plan for your businesses future requirements. We want to be part of the solution, providing financial resilience so your business and your family can focus on what matters. In order to gauge how we can help your business, we will come to you and assess your premises. Not only do we provide a free risk assessment we can advise you on what insurance requirements you need and how best to help you get the best deal possible while covering yourself adequately. Insurers like to see specific measures in place, and we will make you aware of these when we can. These measures also contribute to your image of a smooth, well run business that accounts for risk well. Here at Buckingham Insurance we specialise in the manufacturing, engineering and motor trade industries. That means we have bespoke products available specific to those industries and can accommodate most related risks. We also have special relationships with our carefully selected insurers, cultivated from our 30 years in the insurance industry. You’ll be dealing with advisors who know your industry, so you’ll be able to talk through your specific needs with them. Sometimes a phone call just isn’t enough. We like to keep our business within an hour’s drive of our offices, meaning that you can pop in, or we can come and see you. This makes it easier for problems to be resolved as soon as possible, allowing your business to be run smoothly. Don’t deal with insurers directly when you have professionals to help you chase the claim and get the compensation you deserve. This not only saves you time and effort but ensures you the correct pay out. One of the things the bigger firms will look for when considering whether they should do business with you is how you prepare for risk. While this can be what health and safety procedures you have in place and how well maintained your business premises is, they will also look at what insurance policies you have in place. 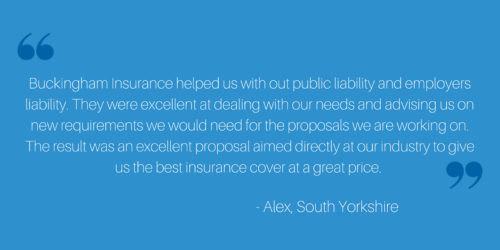 If you’d like to discuss with us business insurance requirements of any kind, you can call us on 01246 570600. Alternatively, fill out the form below.